Many Tuesday games have been moved up, while Wednesday games are still in limbo due to the midweek storm. The midweek storm expected to pound the area Tuesday into Wednesday had many schools adjusting their basketball tournament schedules on Monday. Most schools moved up the time of Tuesday night’s preliminary round and, in Class AA, quarterfinal games in hopes of helping everyone beat the start of the storm. Those with games scheduled for Wednesday continued monitoring the forecast before announcing any changes. Much depends on the timing of the storm, but the forecast had Oxford Hills athletic director Kevin Ryan hopeful on Monday that it would only marginally disrupt the Class AA North girls’ and boys’ quarterfinal games the school is hosting. As of Monday night, the only change was to Tuesday’s girls’ game, which was moved up an hour. The top-seeded Vikings will tip off against No. 8 Lewiston at 6 p.m.
“We’re trying to get it in before the storm hits,” Ryan said. The third-seeded Oxford Hills boys’ game against No. 6 Cheverus was still on for 6:30 p.m. on Wednesday. School being cancelled due to the storm would not automatically result in the game being postponed, but Ryan added he would be keeping a close eye on the forecast and conferring with the SAD 17 superintendents’ office and transportation officials as well as Cheverus administrators before making a final decision. This is the second year in a row Oxford Hills has hosted quarterfinal games on back-to-back nights. “It’s a nice problem to have,” Ryan said. Bangor is the other AA North school hosting two quarterfinal games. The top-seeded boys’ game against No. 8 Lewiston was moved up to a 5 p.m. tip-off on Tuesday, while the third-seeded girls’ game against No. 6 Cheverus was moved from Wednesday to Thursday night. Monmouth Academy shifted its schedule to accommodate the girls’ and boys’ prelim games it is hosting in Foster Memorial Gymnasium. The sixth-seeded girls will face No. 11 Carrabec at 5 p.m. on Tuesday. Contingency plans to reschedule Wednesday’s game between the sixth-seeded boys and No. 11 Mt. Abram to Thursday are in place, but the 6 p.m. tip-off time was still on for Wednesday as of Monday night, and could remain set even if school is canceled, athletic director and boys’ basketball coach Wade Morrill said. Morrill said a number of other factors are involved in the decision, even some not directly related to the games. “It’s our winter carnival week, so we’re trying to balance everything out,” he said. Tipoff time for two other Tuesday Class C South girls’ prelims were moved up, No. 9 Buckfield at No. 8 St. Dom’s to 5 p.m. and Madison at Hebron to 4:30 p.m. The teams who don’t have to worry about Mother Nature disrupting games this week because they already have a quarterfinal spot secured do have at least one alternative concern: rust. The Class B South girls and Class C South boys play in the final quarterfinals on the Portland and Augusta schedules, respectively. For the Oak Hill girls, that means a two-week wait between games that count. The second-seeded Raiders’ regular-season finale against Lisbon was Feb. 5. Their quarterfinal against No. 7 Cape Elizabeth is next Tuesday, Feb. 19 at the Portland Expo. Oak Hill coach Mike Labonte said the respite is needed. Getting the Raiders to their peak mentally and emotionally going into the game may be more of a challenge than the physical preparation with the long layoff. Having experienced a similarly long layoff last year prior to their quarterfinal loss to Lake Region should help the Raiders deal with it this year. LaBonte said the Raiders have been preparing themselves for it all season, essentially. Another adjustment the Raiders have made to be more prepared for this year is playing at the Portland Expo. The bigger court and deeper shooting background can sometimes be a big adjustment for teams playing there for the first time. Like Oak Hill, the Winthrop boys scrimmaged Saturday in the Mountain Valley Conference championship, although coach Todd MacArthur isn’t sure that alone will prevent a lot of rust before the top-seeded Ramblers’ 13-day hiatus ends with their quarterfinal game next Monday night at the Augusta Civic Center. The Ramblers are exceptionally accustomed to long layoffs, having secured a bye to the quarterfinals every year since 2014. MacArthur and his coaching staff have tweaked their practice plan over the years to have the team ready for its turn. Winthrop will face the winner of Wednesday’s prelim between No. 9 Dirigo and No. 8 North Yarmouth Academy. 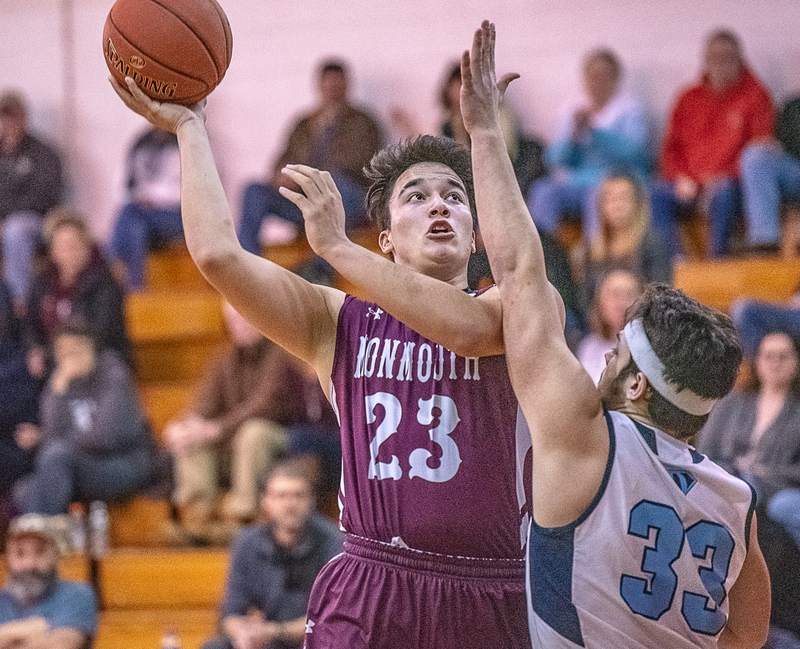 The Leavitt boys will scrimmage Class C South defending champion Hall-Dale on Tuesday to break up their eight-day layoff between the end of the regular season and Friday’s Class A South quarterfinal game against fifth-seeded Kennebunk. The fourth-seeded Hornets are making their first trip to the quarterfinals since 2012 but won’t have their wait prolonged any more than necessary. They will tip off the tournament in the first game at the Portland Expo at 6 p.m. on Friday. Coach Mike Hathaway said even though Kennebunk will be a tough partner for the Hornets’ first dance in seven years, the bye is a reward for his team’s outstanding regular season (15-3). Now they’re focused on proving their staying power with the region’s best teams. To that end, Leavitt has prepared for the bigger tournament floors at the Expo and Cross Insurance Arena, which is the site of the tournament starting in the semifinals. High school courts are typically 10 feet shorter than the college/pro courts at the neutral tournament sites in Portland, Augusta and Bangor.